Life keeps leading us on journeys we would never go on if it were up to us. Don’t be afraid. Have faith. Find the lessons. Trust the journey today. We are all beautiful human beings, just trying to find our way. Today and every day we seek to better understand the meaning of our lives. We long to discover our gifts and release them fully into the world, and we hope to find happiness, peace, and strength along the way. For some of us the key to these desires rings loud and clear, driving what we do and how we do it from moment to moment. For others, these deep seeded needs are buried below the noise of daily life, below ego, below fear, below the pressures and norms that we face in society… and thus, they are rarely addressed. Along my own journey of self-actualization, I’ve witnessed dozens of amazing people — friends, course students, live event attendees, etc. — discover their own paths to happiness and self-fulfillment, and I’ve noticed many common themes emerge. In all cases, the happiness they discover and gradually develop internally is seeded by the realization of certain hard yet fundamental truths about the nature of their lives in the present day. 1. Everything you love and everything you are comfortable with is changing today. Over the past decade, as Marc and I have gradually worked with hundreds of our course students, coaching clients, and live event attendees, we’ve come to understand that the root cause of most human stress is simply our stubborn propensity to hold on to things. In a nutshell, we hold on tight to the hope that things will go exactly as we imagine, and then we complicate our lives to no end when they don’t. So how can we stop holding on? By realizing that there’s nothing to hold on to in the first place. Most of the things we desperately try to hold on to, as if they’re real, solid, everlasting fixtures in our lives, aren’t really there. Or if they are there in some form, they’re changing, fluid, impermanent, or simply imagined in our minds. Life gets a lot easier to deal with when we understand this. Imagine you’re blindfolded and treading water in the center of a large swimming pool, and you’re struggling desperately to grab the edge of the pool that you think is nearby, but really it’s not—it’s far away. Trying to grab that imaginary edge is stressing you out, and tiring you out, as you splash around aimlessly trying to hold on to something that isn’t there. Now imagine you pause, take a deep breath, and realize that there’s nothing nearby to hold on to. Just water around you. You can continue to struggle with grabbing at something that doesn’t exist… or you can accept that there’s only water around you, and relax, and float. 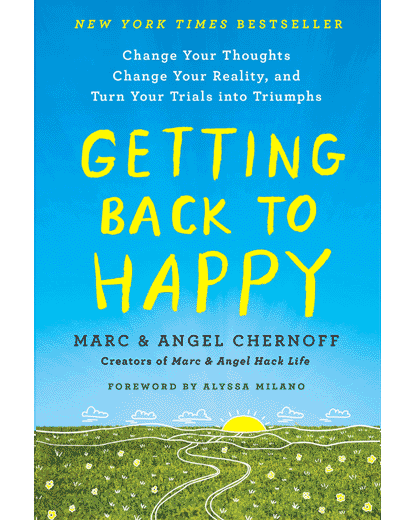 In our new book (a New York Times bestseller), Getting Back to Happy: Change Your Thoughts, Change Your Reality, and Turn Your Trials into Triumphs, Marc and I guide readers through the process of letting GO. And no, it’s not easy. One of the hardest lessons in life is letting go—whether it’s guilt, anger, love or loss. Change is never easy—you fight to hold on and you fight to let go. But letting go is oftentimes the healthiest path forward. It clears out toxic attachments from the past and paves the way to make the most positive use of the present. 2. 98% of the pain you feel today is self-created by your emotional attachments to the past. If somebody is working on themselves and changing for the better, it’s unnecessary to keep bringing up their past. People can change and grow. You know this is true. But, have you given yourself a fair chance to change and grow, too? Have you consciously loosened your grip on everything that’s behind you, so you can step forward again with grace? Growth is painful. Change is painful. But in the end, nothing is as painful as staying stuck somewhere in the past. You can have a heartbreaking story from the past, without letting it rule your present. In the present moment, we all have some kind of pain: anger, sadness, frustration, disappointment, regret, etc. Notice this pain within yourself, watch it closely, and see that it’s caused by whatever story you have in your head about what happened in the past (either in the recent past or in the distant past). Your mind might insist that the pain you feel is caused by what happened (not by the story in your head about it), but what happened in the past is NOT happening right now. It’s over. It has passed. But the pain is still happening right now because of the story you’ve been subconsciously telling yourself about that past incident. You are remembering something that happened. You subconsciously perceive yourself as a victim of this incident. Your memory of what happened causes a strong emotion in you. Inner peace begins the moment you take these deep breaths and choose not to allow the past to rule your present emotions. Have faith in the NOW. 3. Many of the things you’d like to control today are better left uncontrolled. Some things in life are worth changing and controlling. Most things are not. “If you want to control the animals, give them a larger pasture.” That’s a quote Marc and I heard at a meditation retreat several years ago in a group discussion focused on the power of changing your attitude about the things you can’t change or don’t need to change. I see “the animals” and their “larger pasture” as a form of letting go and allowing things to be the way they are. Instead of trying to tightly control something, you’re loosening up, giving it more space—a larger pasture. The animals will be happier; they will roam around and do what they naturally do. And your needs will be met too; you will have more space to be at peace with the way the animals are. This same philosophy holds true for many aspects of life—stepping back and allowing certain things to happen means these things will take care of themselves, and your needs will also be met. You will have less stress (and less to do), and more time and energy to work on the things that truly matter, and the things you actually can control—like your attitude about everything. This form of letting go is not giving up. It’s about surrendering any obsessive attachment to particular people, outcomes and situations. It means showing up every day in your life with the intention to be your best self, and to do the best you know how, without expecting life to go a certain way. It’s about focusing on what matters and let going of what does not. The energy of someone aspiring to create something wonderful, teamed with this kind of surrender, is far more powerful and rewarding than someone determined to create outcomes with a desperate “must have” mentality. Surrender brings inner peace and joy, and lest we forget that our outer lives are a reflection of our inner state of being. So, go ahead and put yourself back in control by letting most things be. 4. Your time today is more priceless and fleeting than it feels. Above all else, her email reminds me that too many of us wait too long to live our best lives. We keep putting everything that’s important to us off until tomorrow. Then, before we know it, we find ourselves asking, “How did it get so late so soon?” Or, we simply don’t have as much time as we expected. Like Laura, make today the beginning of your second chance at life. Take time to figure yourself out. Take time to realize what you want and need. Take time to take risks. Take time to love, laugh, cry, learn, and work for what you need. Life is shorter than it often seems. Let this be your wake-up call to stop waiting. What we do today day defines us! Tomorrow’s progress is always compounded by today’s effort, no matter how small. Many wonderful little things can be done in a day if you don’t always make that day tomorrow. Take positive action and plant the right seeds in your life. Nature herself does not distinguish between what seeds she receives. She grows whatever seeds are planted. This is the way life works. Be mindful of the seeds you plant today, as they will become the crop you harvest tomorrow. Truth be told, someday there REALLY won’t be a tomorrow! And this hard reality needs to be respected. I was actually reminded of all this earlier today when I was chatting with a 74-year-old course student about regrets, and she started our call by saying (I’m sharing this with permission): “Why didn’t I learn to accept and appreciate it all, and treat every day like it was the last time? Honestly, my biggest regret is how often I believed in tomorrow.” … May we all take heed to her words, and learn from them. Which truth discussed above resonates with you the most today? I truly resonate with the analogy of the being blindfolded and confused at center of a pool. No doubt I spend lots of precious energy trying to grab on to edge of certain ideals that don’t exist. Over the last couple years, pretty much ever since I attended your 2016 Think Better Live Better conference, I’ve gotten significantly better at letting go in the way you describe. I’m not necessarily a master just yet, but I’ve learned to float and flow with life instead of splashing around aimlessly. Thank you for another wonderful reminder in my email box at just the right time. I need to learn how to float and flow. Truth number 2 hits home with me. I need to work on having faith in the now. It is happening inside my head – thoughts causing pain. Life is indeed too short to go through needless suffering today for what happened years ago. I do have to stop allowing the past to rule my present. This advice arrived at a perfect time in my case. Thank you so very much! Thank you so much for sending the inspiring article. It’s absolutely true what you said that our 98% unhappiness flows back and makes our lives, family life and individual life hell due to emotional attachment to the past events which are otherwise better to be buried in three layer coffin. We must avoid talking about those stories of life but who will make them understand who always find it good to mutilate the events of distortion. How to keep them quiet for not at least talk about the stories? Those words right there really stuck a chord with me. Thank you for that! I’m not 100% certain, but I think Laura is a classmate of mine from the GBTH course that I connected with in the discussion boards last week. She shared her road back from heart surgery and it truly inspired me to think differently about my own struggles. I just want to say thank her again publicly for the reality check, and I’m also truly grateful for this post. Some truly crucial reminders I need to read again and again. How do you continually deal with a family member from my story, who now continues to hurt me, my children, my husband, my brother & nephew. No matter how many times I address the emotional abuse & she apologizes. She doesn’t stop. I avoid her and have created boundaries. She thinks her company is pleasurable. She doesn’t stop no matter who she upsets??? Since my father passed in 2004, I have been brought to the demarcation line of having to break contact with all my biological family. It is an abusive alcoholic scenario and I have been victimized over and over again. Now I am struggling with loneliness, no family support at all, and a few friends who still don’t understand the plight of abuse victims who break ties. It is possible to forgive and let go without having contact. I will do what I must to protect my soul and spirit, and deal with the aloneness one day at a time! It has happened to me! Almost a lot of time all the time it happened recently! I have this thing of overthinking everything and hurting myself. I hurt myself on the things where I guess I have no fault in, i thus can’t focus on my goals! Thanks a lot for writing this. I will try moving on from all that pain, the pain of being taken for granted, the pain of being taken advantage of , the pain of losing my emotions to someone who never deserved. I will try and be brave. I will believe things will change for the best. This too shall pass. Keep writing. This gives me strength! Thanks! I am a similar age as you but not yet retired, for financial reasons. I too find it is difficult to feel enthusiastic about doing the things that I had once looked forward to having time to do now that most family reponsibities are gone. I am realisng that I have to now carve out a new identity for myself, separate to my work role and the self- esteem and monetary recognition for my work. It seems somehow belittling to work for no financial reward, but I will have to soon as I cant fo on for a lot longer. it is tempting to sit back and fall into “i am too old for this or that ” as an excuse. I find I still want to feel the passion and enthusiam and the article above tells me how. By letting go osf my past roles and stories and taking a new step into unknown pursuits, where yes I may fail but equally where I might find something new about myself , something that will keep me going. It sounds like you are feeling a bit adrift – when that happens to me I spend a moment, counting my blessings and expresing gratitude. It has a wonderfully grounding and re-eneegising effect. Find someone who you can really talk to – it can give you a fresh perspective. Go well. Thanks so much for sharing Laura’s story. The portion that resonated with me the most is how much you can get done in a day if you don’t make that day tomorrow. It makes you truly appreciate the power of today, of now! Of this moment! This article was everything I needed to read this morning. Thank you! This is an awesome article, one I needed and was so glad to read. I’m going through an end of relationship time and trying to move past the hurt but also move past the feeling the need to talk to my ex and also her talk to me. This has helped me to realize that I know I need to move on because my life depends on it. There have been some dark days and I know there will be some more in the future but am grateful to read exactly what I needed today regard pushing for happiness and a positive outlook on the future. Trust me there are days like today that is hard to do. I am currently reading your book. It has been a blessing. I am 63 years old and one of my regrets is that I have been more loyal to others than to myself and holding on to things and people too long. I am always helping others reach their next level and putting myself on the back burner. Consequently, I end up being stuck while they move on. They look back at me long enough to wave as they saunter on their journey. It’s a hard lesson, but I’m learning it. Not only am I learning it, but doing something about it. I had to convince myself it’s not too late. I can see how this would work for a lot of things and am trying to practice this in other areas of my life with success, I’m unsure how I can apply it to my situation now. My mother in law lives at home and has early dementia. We do about 95% of the care and even though it takes up a great deal of our time, we used some of the techniques you suggest and have reframed the effort around this so we consider ourselves truly lucky to be able to care for her. We have to work with my brother in law who refuses to listen to doctors recommendations and just leaves her in bed and does not give her half her medications and thinks he is doing a great job. I appreciate that has good intentions and that he is doing the best he can with the information that he has, but he refuses to educate himself, and doesn’t want us to help him, and says that we are fussing when we follow doctors instructions or ask him to do so. We have left a list of instructions on how to care for my mother in law at her house for when carers come by, but he said he has not read the list and doesn’t think he needs to . He is not reliable and sometimes doesn’t show up. We have suggested to him that we get a carer on a Sunday so that he can just visit , but he point blank refuses and is offended. Both my husband and I are feeling very frustrated and are unsure how deal with this problem. He is unaware of how his behavior impacts on my mother in law. My husband has tried to talk to him nicely but demands that we point prove all her issues to him- it seems just to be argumentative. We have tried working around this with minimal confrontation but it is really exhausting having to revisit after he leaves to make sure my MIL is getting the medication and care that her doctors have asked for. I honestly believe that he really does want the best for his mother, but he is not doing what needs to be done. I am not sure how to deal with this and how I can let this go. I’ve been struggling with the subconscious story in my head for more than 10 years now. Reading this today reaffirms that even though it’s hard to do, I have got to let it go and “float”. At 64 nearing retirement I still don’t know what I want or who I am. You say to take time to know get to know yourself but I truly do not understand how to do this. Living for today is still what I’m working on. But I read your daily emails. I’m spiritual and believe in god highly. And most of what u say is what I read in the bible so I’m grateful for your words and positivity. There’s a lot of blogs doing what you does but I chose to subribe you a year or 2 now when I went through my break up with my ex. 2 years ago and it’ was getting on my knees to god. N most of your emails got me through. Now I am happy and at peace with my inner self. I now Have a great family. A foster mom. Engage and a 7 month old son…n I read your emails whenever I have to be reminded of the positive things in life. I will love to attend any events u have. Please sent me an email of the next one if it’s in New York area I will gladly attend. I have never left a comment before even tho most of your articles have made me feel better. Today’s article hit me at “98% of the pain…created by emotional attachments to the past” and “Many of the things You’d like to Control….all have to do with this 30+ year marriage that hasn’t fulfilled me at all yet here I am still trying to make improvements and try to patch it up when things start to tear but I’m left with so much anxiety/anguish/discomfort/loneliness/heartache (every negative feeling) just so I can basically claim “I kept my family together”…when I’m the one that is falling apart…ugh. I need to shift my focus on something else. I need to stop telling myself past stories that hold me back. I’ve held onto every piece of my difficult past with such preciousness, finding it hard to let go because I feel like those pieces of my history play a large part in making me who I am today. And yet, uncoincidentally, in the present I feel myself somehow stalled from meaningful personal growth. I am sure I will feel much freer if I can manage to implement this lesson. Heather’s comment earlier this morning is totally my own life. At age 76, I realize how I’ve cherished and considered “precious” those things which totally held me back. Now in life’s sunset I’m attempting to move forward slowly in new directions. Thank you all for your personal stories and insights. Once again, you hit it out of the park, Angel. Excellent. And what fits so perfectly is one of your articles I found recently in my Marc and Angel Hack Life file. Your “40 Regrets You Don’t Want to Have in 40 Years.” I’m re-reading that article with a highlighter pen in hand. All good. Thank you! Hi , You made my day . You have actually hit me at my most vulnerable part . Fear, Fear, Fear . The fear of tomorrow that did not exist . I have been so worried about the completion of a project I started almost ten years ago. My fear is that if this project is not completed before my retirement then I may be doomed to be a failure , one because my wife may not be able to sustain it or she may not even have the passion for the project . With what I read in your book, I think I have gotten the right dose of energy to push on without letting it affect my today . Thank you all the way. Thank you so much! You’ve made my day again today. As I was typing this reply, another mail from you just entered my box which I’ll definitely read. I really enjoyed reading this, it gave me a lot of food for thought. Some things are indeed better when left uncontrolled.